This week as I travel to Cafayate I have asked my young associate Worth Wray to write up his research and our conversations on China. Worth has lived in China; and with his (and my) access to people with their fingers on the pulse of China, he has come up with some valuable insights. The hard part for him was to keep it in a single letter. China is a such a huge topic that writing about it can easily yield a tome. I am lucky to have enticed Worth to come to work with me. He is extraordinarily talented and insightful as an economist, has the boundless energy of youth (which means he seemingly doesn’t sleep), and spent the last five years deep in one of the best training grounds that a young analyst could have. He brings his own extensive Rolodex to our organization. In the not too distant future, we plan to start writing a joint letter on portfolio design and construction, translating the macro insights we have into real-world portfolios that can inform your own investing. Lots of I’s to dot and T’s to cross, but we are making progress. Before I teamed up with John last July, I worked as the portfolio strategist for an $18 billion money manager in Houston, TX that, among its other businesses, co-managed (with an elite team of investors from the university endowment world) one of the largest registered funds of funds in the United States. For a bright-eyed kid from South Louisiana, it was a life-changing experience. I had a front-row seat for every investment decision in a multi-billion-dollar portfolio for almost five years; and along with my colleagues and mentors in Texas, North Carolina, New York, Shanghai, and Singapore, I had the chance to meet and interact with a long list of the most sought-after hedge fund, private equity, and venture capital teams. I often found myself in the same room with honest-to-god legends like Kyle Bass, John Paulson, JC Flowers, and Ken Griffin … and I forged lasting some friendships with their portfolio managers and analysts. As you can imagine, the information flow was addictive. I spent thousands of hours poring over manager letters from six continents, doing my best to connect the global macro dots ahead of the markets and coming up with question after question for everyone who would return my calls. That experience plugged me in to an enduring network of truly independent thinkers, forced me to see the world from an entirely different perspective, and put me in an ideal position to figure out what it takes to navigate the unprecedented (not to say strange) investment challenges posed by a “Code Red” world. Sometimes, combing through a mountain of manager letters felt like reading the newspaper years in advance. I remember watching with amazement as a free-thinking global macro investor named Mark Hart made a fortune for his investors by shorting US subprime mortgages and then shifted his focus to what he argued would be the next shoe to drop – a series of sovereign defaults across the Eurozone. Mark explained how the launch of a common currency had allowed historically riskier borrowers like Portugal, Ireland, Italy, Spain, and France to issue sovereign debt for the same borrowing cost as Germany did… without any kind of fiscal union to justify the common rates. The resulting debt splurge led to a big increase in fiscal debts, drove an unwarranted rise in unit labor costs across the southern Eurozone, and essentially activated a ticking time bomb at the very foundations of the euro system. It seemed obvious that rates would eventually diverge to reflect the relative credit risks of the borrowers, but the market didn’t seem to care until it got very bad news from Athens. We all know what happened next. Just as Mark and his team at Corriente Advisors had predicted, spreads blew out in Greece, then in Ireland, then in Portugal, then in Spain… and it now appears that Italy and France are veering toward a similar fate. When the euro crisis finally broke out, my colleagues and I were waiting for it, because Mark had already walked us through his playbook for a multi-act global debt drama. Instead of blowing up in spectacular fashion, the Eurozone crisis has taken far longer to resolve than a lot of investors and economists expected (Mark, John, and myself included); but the euro’s survival thus far has been largely the result of extensive Realpolitik and an increasingly hollow narrative from Mario Draghi and the ECB laying claim to the wherewithal to “do whatever it takes” to preserve the single-currency system. Meanwhile, as Corriente understood, the likelihood of major defaults across the Eurozone rises every day that the ECB does the bare minimum to resist France’s and Italy’s slide toward deflation. It’s not over until the fat lady sings. The point I am trying to make is that Mark saw the fundamental imbalances behind the global financial crisis in time to launch a dedicated fund in 2006, and he saw the root causes of the ongoing European debt crisis in time to launch a dedicated fund in 2007… precisely because he thinks of the global economy as one interconnected system peppered with a series of unstable and still unresolved debt bubbles. Mark is one of the most forward-thinking investors I have ever met and one of the best in recent decades at spotting the big imbalances that spell T-R-O-U-B-L-E. I can’t tell you if he will be right about the next phase of the global debt drama. Predicting the actions and reactions of elected and unelected officials is next to impossible in a Code Red world, but some people have an eye for fundamental imbalances. And since Mark has been largely right in identifying the major debt bubbles that have plagued the world since 2007, John and I can’t comfortably ignore his warning. To my knowledge, Mark Hart and his team at Corriente were the first of many global macro managers to anticipate a hard landing in the People’s Republic of China. Mark argued that the Middle Kingdom would land very hard indeed, popping speculative bubbles in the property and stock markets, sending foreign capital flying out the door, and triggering a rapid collapse in the renminbi … and even if the Chinese government could manage its economy away from a deflationary bust, they would be forced to devalue the renminbi to do so. In other words, Mark saw a much lower renminbi under almost every outcome. It was a mind-blowing concept to me that the main driver of global growth (at the time) could not only implode but even drag the rest of the world down with it. I can’t share the original Corriente China presentation with you for legal reasons, but here are a few public notes published by the Telegraph’s Louise Armistead after she attended one of Mark’s presentations in November 2010. These may look like obvious observations today, the sort you can find plastered all across the internet, but very few people were actually paying attention four years ago. And the data has only gotten worse since 2010 as rampant credit growth and insidious shadow lending have continued to fuel greater and greater capital misallocation. Raw materials: Corriente says China has consumed just 65pc of the cement it has produced in the past five years, after exports. The country is currently outputting more steel than the next seven largest producers combined – it now has 200m tons of excess capacity, more that the EU and Japan's total production so far this year. Property construction: Corriente reckons there is currently an excess of 3.3bn square meters of floor space in the country – yet 200m square metres of new space is being constructed each year. Property prices: The average price-to-rent ratio of China's eight key cities is 39.4 times – this figure was 22.8 times in America just before its housing crisis. Corriente argues: “Lacking alternative investment options, Chinese corporates, households and government entities have invested excess liquidity in the property markets, driving home prices to unsustainable levels.” The result is that the property is out of reach for the majority of ordinary Chinese. The result is that, rather than being the ‘key engine for global growth’, China is an ‘enormous tail-risk’. The markets may damn well prove Mark right, along with a host of other managers who either jumped on his bandwagon or reached the same conclusions independently; but it seemed downright crazy in 2010 to think that the main driver of global growth could abruptly become its biggest threat within a few short years. On a personal note, I obsessed over China’s culture, economy, and political system for years in college and then witnessed the country’s transformation firsthand during my time at Shanghai’s Fudan University in the summer of 2007. Then and later, I marveled at China’s strength relative to the developed world and the seemingly invincible central government’s ability to keep the economy chugging along with credit growth and fixed investment while it hoped for the return of its developed-world customers then mired in the Great Recession. It wasn’t what I wanted to hear … but I had to accept that Mark could be right. He had clearly identified a major imbalance which has continued to worsen over the last few years, and now we are just waiting for the next shoe to drop. Four years later, Chinese production is slowing in the shadow of a massive credit bubble and in the face of aggressive reforms. Disappointing investment returns are revealing broad-based capital misallocation; property prices are cooling (relative to other countries); and commodity stockpiles are mounting. With China’s new policy of allowing defaults (historically, China’s default rate has been 0%), there is a real risk that follow-on events could spin out of control, raising nonperforming loan ratios and sparking a panic as bank capital is significantly eroded. In the meantime, the renminbi is trading down, most likely due to an intentional effort by the People’s Bank of China to aid in the slow unwinding of leveraged trade finance. Now the signs of a Chinese slowdown (and thus a global one, as the world is geared to 8% Chinese growth) are clear, and people around the world are meeting uncertainty with emotion. With that in mind, let’s dig into the data that really matters and try to get to the heart of China’s dilemma. After 30 years of sustained economic growth topping 8% and a successful bank cleanup in 2000, the People’s Republic was well on its way to blowing through the “middle income trap” and transitioning to a more advanced consumption-based economy. But then in 2008 the banking crisis in the United States abruptly ushered in a painful era of balance sheet repair across the developed world and delivered a demand shock to emerging markets. Rather than allow the Chinese economy to fall into recession at such an inconvenient time, the Party leadership sprang into action to stimulate demand with its largest fiscal deficit in more than 60 years and to mobilize bank lending with historically low interest rates and enormous liquidity injections. As you can see in the charts above, China’s total debt-to-GDP (including estimates for shadow banks) grew by roughly 20% per year, from just under 150% in 2008 to nearly than 210% at the end of 2012 … and continued rising in 2013. 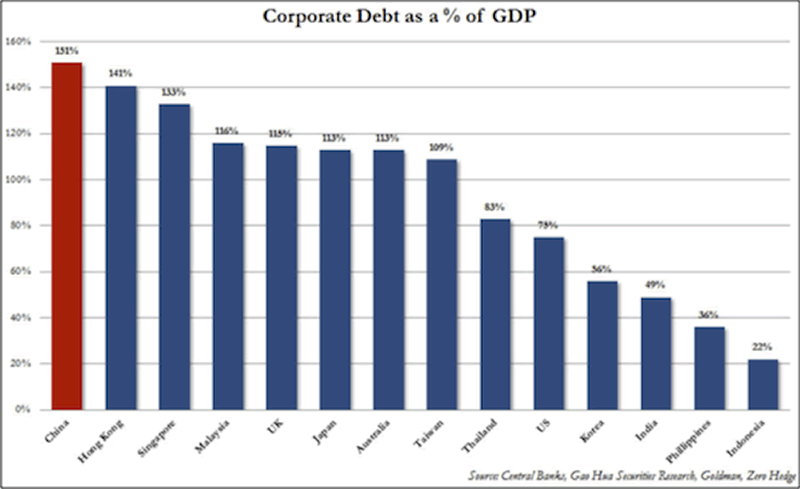 Even more ominous, corporate debt has soared from 92% in 2008 to 150% today against the expectation that China’s government would always backstop defaults. That makes Chinese corporates the most highly levered in the world and more than twice as levered as US corporates, just as corporate defaults are happening for the very first time in more than 60 years. Looking further into the debt problem, China is steadily incurring more and more credit for less and less growth – suggesting that the newer debt is less productive because it is being put to unproductive uses – as you can see in Chart 2 above. That explains why many analysts believe China’s official reported nonperforming loan ratio of 1% is more like 11% – or more than 20% of GDP. Note: Joining The Mauldin Circle is not an offering for any investment. It represents only the opinions of John Mauldin and Millennium Wave Investments. It is intended solely for investors who have registered with Millennium Wave Investments and its partners at http://www.MauldinCircle.com (formerly AccreditedInvestor.ws) or directly related websites. The Mauldin Circle may send out material that is provided on a confidential basis, and subscribers to the Mauldin Circle are not to send this letter to anyone other than their professional investment counselors. Investors should discuss any investment with their personal investment counsel. John Mauldin is the President of Millennium Wave Advisors, LLC (MWA), which is an investment advisory firm registered with multiple states. John Mauldin is a registered representative of Millennium Wave Securities, LLC, (MWS), an FINRA registered broker-dealer. MWS is also a Commodity Pool Operator (CPO) and a Commodity Trading Advisor (CTA) registered with the CFTC, as well as an Introducing Broker (IB). Millennium Wave Investments is a dba of MWA LLC and MWS LLC. Millennium Wave Investments cooperates in the consulting on and marketing of private and non-private investment offerings with other independent firms such as Altegris Investments; Capital Management Group; Absolute Return Partners, LLP; Fynn Capital; Nicola Wealth Management; and Plexus Asset Management. Investment offerings recommended by Mauldin may pay a portion of their fees to these independent firms, who will share 1/3 of those fees with MWS and thus with Mauldin. Any views expressed herein are provided for information purposes only and should not be construed in any way as an offer, an endorsement, or inducement to invest with any CTA, fund, or program mentioned here or elsewhere. Before seeking any advisor's services or making an investment in a fund, investors must read and examine thoroughly the respective disclosure document or offering memorandum. Since these firms and Mauldin receive fees from the funds they recommend/market, they only recommend/market products with which they have been able to negotiate fee arrangements. The article Thoughts from the Frontline: China’s Minsky Moment? was originally published at mauldineconomics.com.